In August 2017, UiPath commissioned Forrester Consulting to evaluate the state of RPA. Forrester conducted an online survey of 105 managers from France, Germany, Japan, the UK, and the US. Participants include decision makers in financial services, retail, manufacturing, oil and gas, and insurance. The study investigates how digital workers support employees in improving automation efforts, the effects on job performance from having bots increasingly involved in tasks, and what respective firms plan to gain from RPA. Unsurprisingly, reducing errors (62%) and enabling focus on more strategic work (61%) are the dominant targets. Meet Craig le Clair, Vice President of Forrester, and Bobby Patrick, CMO UiPath who will be discussing the state of Enterprise RPA in a dedicated webinar on Wed, Feb 28, 2018 at 6:00 PM - 7:00 PM EET. At the time of the survey, 49% of the firms were aiming to implement RPA within the following 12 months, while 45% confirmed they had already implemented digital workers within the previous 12 month or more. These companies are avid for solutions to accelerate their progress within the journey. Those who adopt digital processes will not run the risk of lagging behind, they will instead gain immediate advantages by increasing operational speed and quality, lowering costs, and making better, data driven decisions. Besides improving business process efficiency, much of the focus is on enabling greater customer experiences by making service teams more efficient and calibrating them to engage strategically. As any relatively new technology, RPA still presents a challenge for many companies as they struggle to get a grip on how to fully implement it successfully. The top three technical and deployment issues organizations face are related to performance and scalability (70%), the difficulty to manage rules that guide bot behavior (69%), and immaturity in controlling and operating the digital workforce (61%). Other concerns cite the integration with desktop management tools (58%) and insufficient reporting of the complete end-to-end process (58%). The most often met roadblocks concern the rush to deploy RPA across processes that are not suitable, avoiding to involve both business and IT teams in the project early on, and the shortage of skills and expertise available in the market. Three quarters of firms have a clear vision of how their organization can leverage RPA. But RPA needs to be owned and managed in order to make full use of its capabilities. That’s why racing to pick the low hanging fruits and not having the vision and strategy of how it will extend into the organization’s wider operations usually fails to deliver the most value. Most enterprises are planning to work with RPA solutions providers to avoid launching poorly designed automation initiatives. Those providers that can offer references for smart, scalable implementations will better capture the confidence of customer organizations. But what do enterprises expect from their RPA technology vendor? Enterprises are at different stages of maturity and speed of adoption. But there is a general consensus on the main prerequisites for Enterprise RPA – ease of control and operations management (64%), proof of scalability and extensibility (60%), and a roadmap to Cognitive and Artificial Intelligence (AI) (56%). Forrester has identified thirteen AI technology building blocks that can add higher capabilities to the digital workforce of the future. As RPA evolves to incorporate AI functions, over the next two years we will see bots increasingly capable to mimic human intelligence through experience and learning, significantly extending the applications of RPA and creating better automation use cases. 46% of respondents expect AI-enabled RPA robots to support complex decision making and work on diverse data sets to create a cohesive 360-degree view of the customer. They expect chatbots to have a key role in elevating service to the customer, whether by improving customer self service (52%) or by enabling employees to deliver more personalized services. There’s a lot in store for (intelligent) automation. 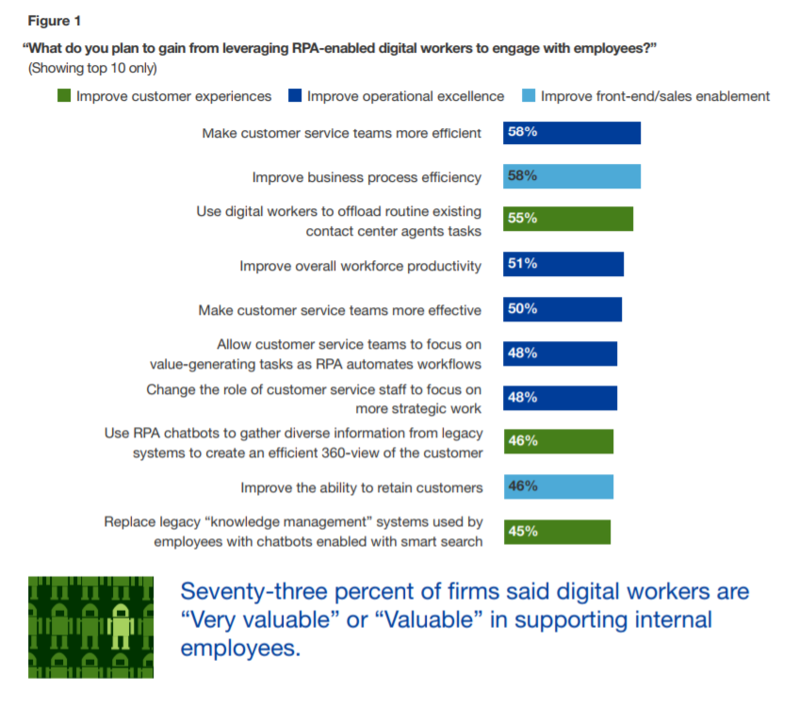 Forrester’s research suggests that in 2018 only, RPA-based digital workers will replace or augment 311,000 office and administrative positions and 260,000 sales and related positions. Early adopters are now scaling their deployments, having overcome the challenges and paved the way for newcomers. 2018 will be a very exciting year for RPA. If you would like to read the full study and learn all the important recommendations concluding this research, please contact us here.